By signing up, your school will be enrolled in the School Rewards™ Program for the chance to win great prizes. If your school would like to collect coats but not participate in the School Rewards™ Program, please send an email to info@caringpartnersinc.org. Please Note: Public, Parochial, and Independent Schools may participate. Any School that wins a prize for 3 consecutive years will have one year of ineligibility. 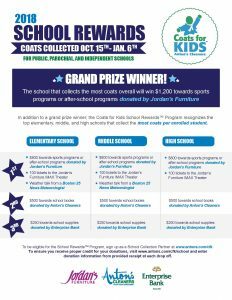 What can your school win? Visit our website, and click “Post Donations”. Find your school in the drop down menu, and input the required fields from the donation receipt (i.e. receipt number, number of coats). Your points will automatically be calculated based on the number of coats donated per student. It may take up to a week for your leaderboard totals to update. **For Public, Parochial, and Independent Schools. Any School that wins for 3 consecutive years will have one year of ineligibility.